JJ Abrams | Thoughts On "S"
Karst & Son is the publisher of Straka’s first 18 works. A fellow S enthusiast, Adam Laceky, noticed a tombstone with the name Carstensen and pointed out the similarities to Karst & Son. This led me back to Jan Carstenszoon, a 17th-century Dutch explorer who is referenced by code in the TV show LOST. And why? Because in 1623 he landed in Australia, which until that time had been sparsely glimpsed, not known to be a new continent, and yet to be included on any map of the world available to the general public. It was his exploration in 1623 that led to this first widely available map of the world to show any portion of Australia – a 1630 map by Hendrik Hondius. The search for Terra Australia Incognita and its cartography is a metaphor for self-discovery. S’s journey is exactly that – the search to discover who he is. And our very first footnote from FXC points us back to that metaphor. The second footnote in the book may also lead to a map. Turn the page and let’s see. Le Monde did not exist in 1935. It was founded in December, 1944. So just what is FXC trying to say? Typically when she mentions something that is obviously false, it is a clue. In the December, 1935 issue of National Geographic a map was included. 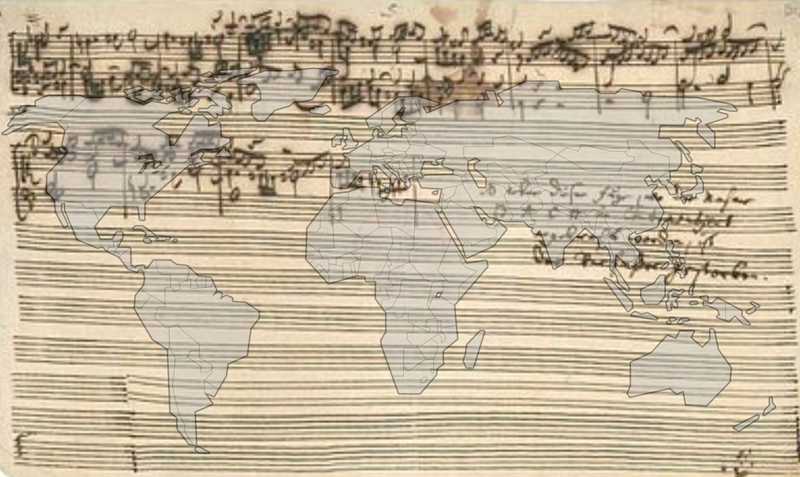 The title of the map is The World (or Le Monde in French). Moreover, this World Map is the first to be issued showing with certainty that Antarctica is a single continent, not two islands – the epochal conclusion reached by Admiral Byrd after a series of flights and surveys made on his expedition of 1933-35. Two maps, both pertaining to the search for Terra Australis Incognita, and both the first of their kind to reveal or confirm a new continent. The first map also leads us to 1623 (remember the LOST numbers 4, 8, 15, 16, 23, 42?). S seems to be filled with references to Shakespeare, and in 1623 Shakespeare’s First Folio was published. It is considered one, if not the, most influential books published in the English language. The second map points us to Antarctica, which has many possible references in S.
And Hemingway? There is no evidence that he and Straka and the relationship that FXC suggests. So is Hemingway a clue? If so, here’s one idea. Hemingway had a deep focus on physical locations in his works – literary cartography? This seems to be a deliberate design, and there must be much more to uncover. 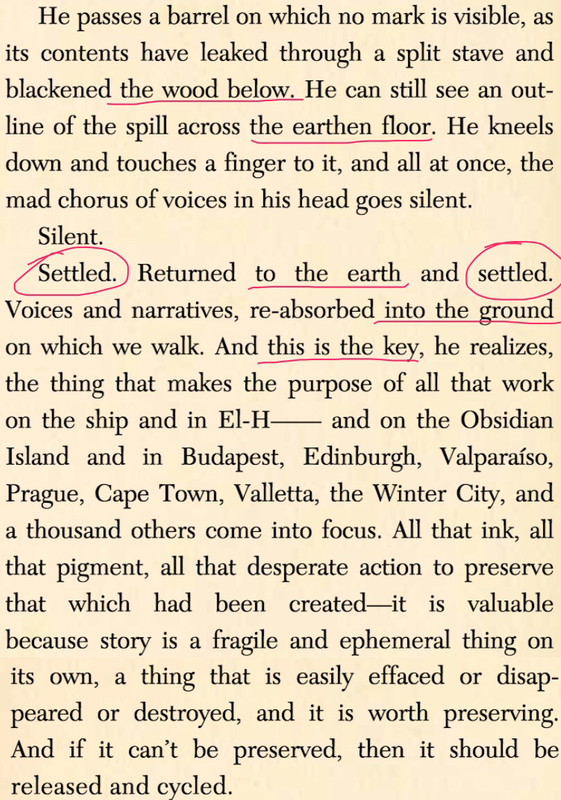 Given that JJ Abrams and Doug Dorst have called the book S a “love letter to the written word”, it is very possible that this footnote is hinting to us that Shakespeare and/or Australia and/or Antarctica and/or cartography is a key to deciphering the mysteries of S.
Some time ago, we discovered that the sum of the numbers of the agents mentioned in the Interlude was 171 (19×9). Some other time ago, Adam Laceky told me he was convinced that the major mnemonic system was somehow afoot within the Interlude and perhaps more of SoT. I had never heard of the MM and was reluctant to believe. He pointed out that if you take the numbers of the first two agents mentioned in the Interlude (4, 34) and apply the MM, you get the word RUMOR. Intriguing, given the emphasis on that word in the footnotes and the alternative title to Ship of Theseus (Principality of Rumor), but still. Is there more? On p307, Adam insists, we discover the 5th Fn of the Interlude, and it focuses heavily on music. In the MM, 307 = music. Apophenia! I challenge. To which Adam points out that Sola = 05, and there is a conspicuous absence in the agent numbers of either 5 or 0, as there is a conspicuous absence of Sola in the Interlude. At this point, Adam had me delving into the world of the MM and searching to corroborate his insistence that it had something to do with the Interlude code. Whereas I have always been convinced that the key was the title of chapter: Toccata and Fugue in Free Time – just as Jennifer Hayward writes herself directly beneath the title. What if both are true? Toccata = 171 – which happens to be the sum of our agent numbers. Fugue = 87 – the sum of agents 4, 34, 47, and 2. Free = 84 – the sum of the remaining agents 26, 8, 9, and 41. Toccata = Fugue + Free? What about time, you say? Where does it fit in? Time = 13 – the number of footnotes in the Interlude. I’m now convinced. The MM is somehow a key, if not the key, to the interlude cipher. Adam and I are calling on the rest of you who are still working on S to join us in ferreting out the Interlude cipher and its solution. Together, we should discover it in time. Here is a beginning framework of what it means to follow the monkey. It is only that. A framework. A beginning. An armature. We still need to work together to solve the remaining mysteries of S. It is my hope that an explanation of this armature helps us do just that. To orient ourselves, here are a few previous blog posts that help set the stage. A feedback loop involves four distinct stages. First comes the data: A behavior must be measured, captured, and stored. This is the evidence stage. Second, the information must be relayed to the individual, not in the raw-data form in which it was captured but in a context that makes it emotionally resonant. This is the relevance stage. But even compelling information is useless if we don’t know what to make of it, so we need a third stage: consequence. The information must illuminate one or more paths ahead. And finally, the fourth stage: action. There must be a clear moment when the individual can recalibrate a behavior, make a choice, and act. Then that action is measured, and the feedback loop can run once more, every action stimulating new behaviors that inch us closer to our goals. An individual gathers new information. The irrelevancies of that data are stripped away and what matters is emotionally conveyed to the individual for rumination. 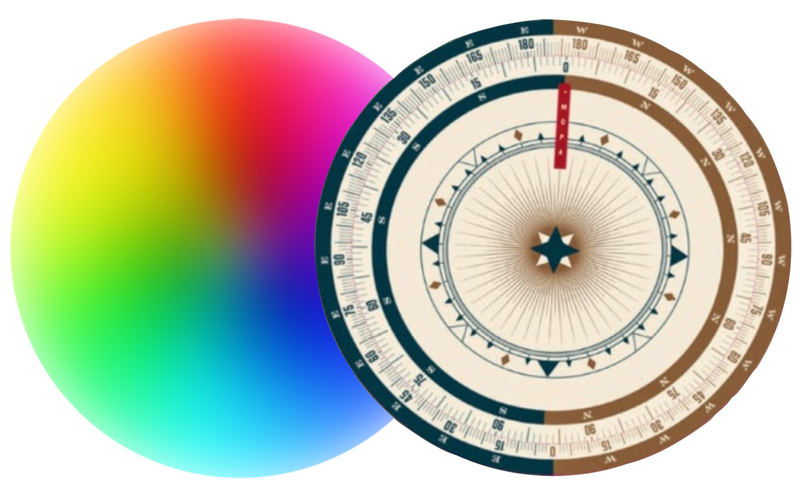 Insights – creative leaps (as the author of Godel, Escher, Back would call them) – from the new information drive the individual to continue to write his/her story with the new paths of choice that are illuminated. The individual selects one path of illumination, recalibrating his/her behavior accordingly. Then the feedback loop repeats. Communications between two people always include feedback loops. The act of writing creates a feedback loop between author and reader. What we witness in the marginalia of Eric and Jen’s writing is a concrete example of cybernetics at play: continuous feedback as both Eric and Jen learn more about each other and about themselves with each new message between them. There is a very special kind of feedback loop, though, that does something more that just illuminate paths that might be taken in the future. Sometimes information introduced to an individual – a new truth – forces what we call an epistemological crisis. An epistemological crisis occurs when new information – a new truth – arrives in the feedback loop that challenges everything we already thought we believed to be true, forcing us to rewrite our former story with a new schema. Most of us who watched Sixth Sense experienced an epistemological crisis. We watched a story unfold and began forming a framework of understanding that story. And then, at the climax, we were presented with a truth that forced us to completely rewrite our understanding of the story we had just witnessed. All the events of the story were exactly the same, but their meaning changed entirely. It was a true Ship of Theseus moment. We had to ask ourselves, is it the same story, even though I just had to replace most if not all the parts of how I built the story in my head with completely new parts that integrated the new truth? With all of this in mind, I believe that to follow the monkey is to embark on a journey as readers to identify the feedback loops that lead to epistemological crisis – to discover the new truths that cause us to rewrite our current understanding of S – until, after multiple iterations, we arrive at the best possible account – a true and intelligible narrative. Our Ship of Theseus is undergoing continual changes, sometimes with complete destruction and reconstruction, as we do our best to form the ship that S sees through the spyglass at the end. This is evident to us as S himself witnesses the ship undergo its changes, construction, and deconstruction. It’s also bared before us as S sits down in The Lady‘s cabin to read The Book of S and struggles to understand why it contains schematics for the ship’s construction along with a catalog of its changes. The changes S’s ship endures are the changes our understanding of S goes through with each new truth we discover. Our schematics for explaining the story are continually changing. Below is a catalog of the appearances of our monkey and a likely incomplete ilustration of how feedback loops and epistemological crises are hidden before us in plain sight to keep us following. (Keep in mind, all forms of communication between two people involve feedback loops). The tone-deaf immigrant and barrel organ owner struggle to communicate through their language barrier. The barrel organs are ground – organ grinding – turning loops to make sounds. The immigrant hides a truth about the money in the monkey’s pocket that will rewrite his peaceful escape. The barrel organ owner hides a truth about which stack of money is more valuable. The barrel organ owner suspects the truth about the immigrant holding out on him and that he intends to attack the immigrant later to determine the truth that the immigrant is hiding. All of this leads to S seeing the monkey later as he passes out. In Fn2, p8, FXC reveals the truth about the note pinned to the monkey that accepted Straka’s award from Bouchard. This new truth requires rewriting the story of what everyone else thought happened before FXC’s reveal. 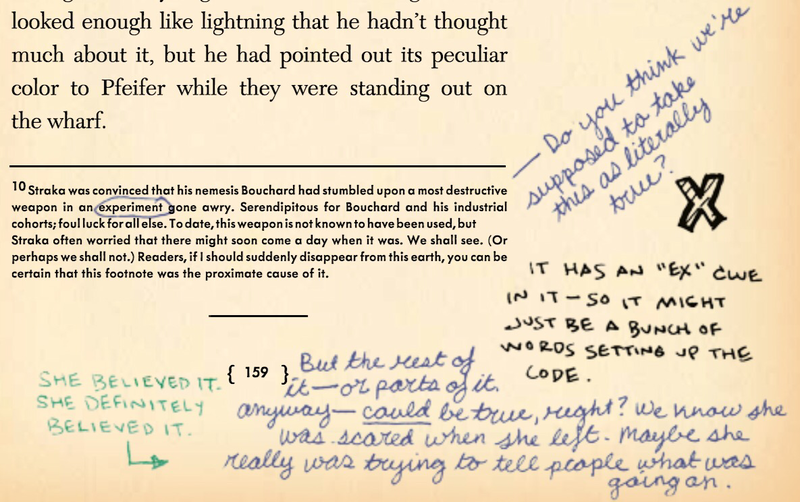 The marginalia reveals Jen and Eric attempting to determine the truth about Bouchard and the S organization. The truths are elusive. This first time that we see the monkey, he is in a room full of barrel organs. The last time we see the monkey, he is releasing wine from barrels back to the earth. S is obducted while attempting to communicate with Sola and arrive at truths that will help him successfully construct the narrative of his life – his identity. Two life-long pursuits are born in S: Sola and The Archer’s Tales. The Archer’s Tales – an archer uses literal feedback loops (the bull’s-eye target) to readjust his aim with the feedback he receives from the previous shot. The drug makes it impossible for S to understand communications. In the pocket of the monkey’s tattered red coat is money (truth) that would serve as a feedback loop to the suspicions of the barrel organ owner. The barrel organ owner’s sons are chasing the feedback they need, and S encourages the monkey to keep running. We, the readers, are chasing feedback to help us understand S. But that monkey is running ahead of us, with S’s encouragement, and therein lies the game we are all playing right now. The monkey is rescued from the ghost ship and come’s aboard the xebec (54-56). The feedback loop we long to know – is this the same monkey? Maelstrom mentions the monkey. Maelstrom’s name means mill stream. A mill stream is a special diversion of water to drive a waterwheel – loops of water. Maelstrom once says that all I means t’ steer the ship. The word cybernetics means, literally, the one who steers. S undergoes a brief epistemological crisis. He thinks the monkey is a baby for a moment, his heart sinking, and then he looks closer and realizes the truth. Eric’s pencilled marginalia suggests the monkey is an iteration of S. To iterate is to repeat. A loop. The insert in these pages is a telegram from Straka to Karst & Sons with new information – a feedback loop to the publishers. FXC is to take over henceforth as translator. Fn6, p55 references a Spider Prince and the marginalia has a drawn spider web. Spiders create their webs with loops. The monkey flees the approaching waterspouts and goes down the hatch (62). S’s vision of the waterspouts has a mysterious feedback loop (that we don’t yet understand) to Sola in the tavern drinking her drink. In the present, the monkey runs “down the hatch” – is this a deliberate connection? The ship is destroyed by the waterspouts, but S survives. Here we have a metaphor for our schema of understanding being destroyed and later reconstructed after we undergo new experiences. In the marginalia – Eric’s uncle doesn’t know the truth of why Eric backed out of the trip on the boat. Jen writes that she knew something Eric said earlier here wasn’t the whole story. So it needs to be rewritten. S spots the monkey on the resurrected xebec after his leap from the cave (200-201). S undergoes a much larger epistemological crisis the moment he sees the ship: how is the ship all put back together? So soon? But it’s different now, but still the same ship. S started in the water after leaving the ship and emerged in B__. Now he leaps from the cave and returns to water, where he once again finds the ship – one large loop. The monkey is swinging loops in the halyard. The postcard insert here presents us with a feedback loop inducing another important epistemological crisis: Not only is FXC alive – but Eric FOUND HER. FXC will give many new insights (feedback loops) to S to aid him in the story. Her words, her letters, and eventually her personal copy of the alternate ending to “S” that help Eric and Jen rewrite their narrative tha they are piecing together about FXC and Straka, about S and Sola. There is a feedback loop and epistemological crisis symbolized in S’s round trip to El H__. Before he leaves, he cannot possibly imagine returning, but Maelstrom explains that he will and you’ll be ‘hap to. It turns out to be true, but only after S experiences what he does in El H__ and sees why. In Fn6, p219, a new truth (reinforced by Eric’s notes) explains confusion caused in Straka’s communications. Maelstrom takes S’s nail, telling him not to deface the ship. S insists that the truth of the story about the nail and his carving is not defacing. S struggles to rewrite the story of what is going on with his life when Maelstrom informs him that Vevoda “cogs yer venin.” This new truth is disturbing to S.
Jen secures a meeting with Ilsa but is concerned that she won’t understand the truth. In the marginalia we witness several discussions of nended truth: what happened in Havana and when MacInnes left S.
S and the woman struggle to communicate. The woman and the monkey struggle to communicate. The monkey is running around the pouting sailor in loops. S seeks Maelstrom: the one who speaks, the one whose name evokes thoughts of looping water, and who steers the ship (cybernetics). We have an epistemological crisis in understanding whether or not the pouting sailor is also The Lady of Obsidian Island? And if she is, how? A barrel is made up of wooden loops formed by a cooper. Corbeau’s father was a cooper (123). The crew is struggling understand Maelstrom’s communications. They pause, waiting to be sure they heard correctly. After the feedback loop is complete, they change their plans and head for Obsidian Island. Whistles operate on the principle of feedback loops to create sound. Lewis Looper is mentioned in the Fn on p270 as al this happens. In the marginalia, we witness the very first mention of Eric/Jen having met in person. A brand new feedback loop is introduced. Jen mentions a specific feedback loop that creates one of her own epistemological crises: she runs into her old college roommate and discovers that she was much more like her than she thought, but Jacob distracted her from noticing. We see a crystal clear feedback loop and epistemological crisis for many. Maelstrom and his crew have one when they find S down in the orlop writing.“‘Ah, hell,’ Maelstrom seems to be saying, ‘it dint ness t’go li’ this.’ But now it does.” New information rewrites the story. S once hated the idea of even thinking of becoming on of the crew, and now he finds himself becoming one. Everything rewritten. S’s lips are sewn together with loops of black thread. The pouting sailor who was the one in the last monkey sighting with the mop, and may very well be The Lady of Obsidian Island, provides the fishhook with a snarl to Maelstrom, who sews S’s lips. In the marginalia we find several small instances of feedback loops. Now that Vevoda’s planes have penetrated where ships like us were formered safe, the direction of the story must change. S gets his wish to go to The Territory after all. Jen finds out her sister and Jacob are the reason Mom and Dad are coming for a visit. This new information enrages her. S struggles to communicate with Anca and Waqar. S is in the middle of a loop between leaving the ship to find the Governor (cybernetics), realizing who the Governor is, and returning to the ship to find it destroyed. Eric circles Nemec and writes discrepancy with original manuscript. This new information changes the story that Straka wrote. FXC changed the original to Nemec to reflect the new truth of who the traitor actually was. S, upon hearing birdsong that seems out of place, loops back through the thought of his friends when he catalogs the sounds (a Merlin, an Oystercatcher, a Raven, and a Magpie Tanager). The monkey leads S to the biggest epistemological crisis of his life: the governor is Pfeifer. S has gone from the man who would risk his life to save Pfeifer to the man who would choose to end his life. Who S thought he was change in this loop from cave to hilltop. As he runs to escape the rifle of the guard, a magpie dies from a bullet wound. This and the destruction of the ship force S to rewrite his own narrative – he is who he is because of his actions, not because of his past that he does not remember. A man is no more and no less than the story of his passion and deeds (see insert on page 361). S completes the loop between the ship’s destruction, his time in the Winter City, and returning with Sola. The ship is reconstructed. The monkey still alive. We don’t know yet but Maelstrom’s spyglass is underneath the blanket where S sees him sleep. Jen completes the feedback loop with Jacob over his “betrayal” in involving her sister/parents. Another Santorini man occurs, changing the story of whether the S is still active and the enemy is still in pursuit. The feedback loop of the wine being “recycled” – settled. S has a positive epistemological crisis with a feedback loop. After he feels the voices in his head go silent and settled when the wine in the barrels is released back into the earth and recycled, he no longer wishes to destroy his enemy. He rewrites the ending. We hear the squeal of feedback from Edvar Vevoda VI’s microphone as he is apparently shot and dies on stage – while presenting truth to the crowd in an unscripted speech. Draw near, gentlemen, draw near, do not miss any of these words for this is Truth and it is a miraculous thing (445). This is where FXC takes over with her version of the ending – where she rewrites the narrative based on her perceived truth. Jen says on p455 See. This whole final sequence was hers. From the monkey’s appearance on. In the marginalia, there are discussions about the temperature of the apartment in Prague. They mention how cold it is, which hearkens back to page 447 when they talk about the thermostat – one of the most basic cybernetic systems with a feedback loop. In the marginalia, we are presented with the unfinished narrative of what happened at the planetarium before Jen and Eric left the country for Prague. The spyglass reveals another ship. The way things can and will be when the full truth is finally clear. Maelstrom often studied the maps, acted on the feedback loop of growing redness, and looking through the spyglass for more feedback. Eric/Jen discuss how they now know FXC’s alt version started from the monkey’s appearance on. Eric thinks FXC’s ending is ambiguous. Jen disagrees. We now have the question of whether or not Jen/Eric are ok. OK is scratched out and we have the copy of their book. The monkey uses a raw piece of substance to release the wine from the barrels. The sounds are loud. The monkey might as well be one with S.
The monkey kills Vevoda with the piece of substance. The story ends from the perspective of the monkey. It knows Vevoda is dead. It knows S is transparent – and knows that S is unaware of this. It feels like there is something essential about the man that it has failed to understand. We are left with the search for the truth of understanding what essential something will help us rewrite the narrative, discover S’s name, understand Eric and Jen’s story, find out what really happened in Havana, whether Straka lived, etc. Where do we go from here? We continue to follow the monkey – to search for those hidden truths that help us rewrite our current understanding of the story so that we can create the most true and intelligible narrative that we can. The first time S finds himself on the ship and wanders around to gain a sense of where – and what – he is, Jen writes in the margins that she has discovered a new truth: that FXC is a woman. Eric writes this changes everything (29). In the chapter, The Drifting Twins, S watches in horror as the constellations drift in such a way that the stars no longer have meaning. New meaning must be made. New narratives created. When S discovers the truth of the bomb in B, in advance of its detonation, this feedback forces him to abandon his quest to follow Sola and return to his newfound friends and explain the truth. Despite this, the townsfolk believe the newspaper accounts that these very same people who tried to stop the bomb are actually responsible for it. This false narrative, created by Vevoda and given momentum by fear, changes the story and makes our friends fugitives fleeing for their lives. What begins at the water shall end there, and what ends there shall once more begin. This is a good way of describing a cybernetic system. All of Agent #4’s travels seem to occur just prior to major conflict in that area. It appears that the Agents of Vevoda are tasked with being an instigator or at least a catalyst to conflict in order to drive sales for Vevoda. He sent one of S’s wharf-rat confederates plummeting into a gorge (O, poetry!). (B–. October, 1906). See p175. He has performed dozens of S-dispatches, spanning three decades. It’s safe to conclude that all of the Agents may have travelled in order to ensure conflict that would drive sales of the Black Vine. In addition to all of the sightings of Agent#4 we are about to examine, we know for certain that he was part of the conspiracy to assassinate Archduke Ferdinand in Sarajevo on June 28, 1914 (see pp299-304). He was in Sarajevo shortly before the assassination, sitting in Schiller’s Delicatessen, urging a member of the conspiracy to get the job done. He then boarded a train for Budapest, where he met his untimely demise at the hands of S and his bottle of plum rakija. With this in mind, let’s analyze the other known locations of Agent #4 and the potential conflicts he may have had a role in birthing. See pp261-262. Danzig – Berlin, October, 1908. This particular notation relates to the photograph itself on the back of which the locations are written. Agent#4 is traveling from Danzig to Berlin, Germany. It was in Berlin in October 1908 that the Bosnian Crisis began. We can safely conclude that Agent #4 was there to ensure this crisis occurred. Tangier, June 1905. The First Moroccan Crisis began in Tangier, Morocco in March of 1905 and peaked in mid-June of the same year, likely thanks to our friendly agent. B—, October 1906. We have yet to discover the location of B—, but it seems clear that Agent #4 was present to ensure that the bomb provocation incident on the wharf (a plan the other agents knew about for days – see p104) took place. See p100-101 for S’s eyewitness account of Agent #4 handing the bomb to the Agent in the boiler suit, followed by p261 when S recognizes him as Agent #4 from the photograph. Los Angeles, December 1910. The Magonista Rebellion surged after the release of The Magon brothers from a Los Angeles jail in 1910. Their rebellion, centered at this time from Los Angeles, is considered a large spark which began the Mexican Revolution. Tripoli, September 1911. The Italo-Turkish War began in September, 1911, beginning as the Italian Fleet arrived at Tripoli and began bombing the port. Salonika, March 1912. Salonika, today known as Thessaloniki, is the capital of Macedonia. In 1912, Greece, Bulgaria, and Serbia abandoned their then differences with Macedonia and formed a coalition against the Ottoman Empire. This helped spark the First Balkan War, in which Thessaloniki had to surrender in October, 1912. Sarajevo – June 28, 1914. Agent #4 is a conspirator in the assassination of Archduke Ferdinand, igniting World War I.
Budapest, June 28, 1914. Agent #4’s lifeless body arrives on the train. In the climax of S, we find S kneeling down on the ground and placing his finger in the moist earth where the black wine and the ground meet. And when that moment occurs, all at once, the mad chorus of voices in his head goes silent. Let’s look at where these etymological connotations surface in Ship of Theseus. They occur in conspicuously important moments, and most interestingly, in every case in the book where a key is involved, along with references to the ground. S first sees Khatef-Zelh as she goes to retrieve a portrait and then “settles herself onto the floor” and begins to cut the canvas free of the frame. The face in the portrait is Sola’s (242-243). The first time S is with Sola in the orlop of the ship, he settled himself into the chair and reached for the hourglass (407). The descent into the caves. The way out was down. Is down. The setting of multiple heavenly bodies in The Drifting Twins. Choices. Think Obsidian Island and The Lady. When the soon-to-be fugitives approach Stenfalk’s house, it has a mossy roof that looks on the verge of caving in. Stenfalk reaches up into a window box and produces a key” (109). The window box, which would be made of wood and have dirt in it, is also directly beneath the window where later S notices the S symbol and a mirror image of it in the scrollwork cuts of the shutters (131). He kneels down and touches a finger to it, and all at once, the mad chorus of voices in his head goes silent. Silent. Settled. Returned to the earth and settled. Voices and narratives, re-absorbed into the ground on which we walk. And this is the key, he realizes, the thing that makes the purpose of all that work on the ship and in El-H— and on the Obsidian Island and in Budapest, Edinburgh, Valparaíso, Prague, Cape Town, Valletta, the Winter City, and a thousand others come into focus. All that ink, all that pigment, all that desperate action to preserve that which had been created—it is valuable because story is a fragile and ephemeral thing on its own, a thing that is easily effaced or disappeared or destroyed, and it is worth preserving. And if it can’t be preserved, then it should be released and cycled.To write with the black stuff is to create and, at the same time, to resurrect. We write with what those who’ve come before us wrote. Everything rewritten. Part o’ the tradition (450-451). In the alternate version believed to be the “real” end to Chapter 10 written by V.M. Straka, S is struck by Vevoda’s bullet in the collarbone – the clavicle (which means little key). It is not until the pistol fires and pain rakes his collarbone that he realizes what his instantaneous reconnoitering did not reveal. Where is she? The bullet sails beyond, carrying his skin and blood. It ricochets off an earthen wall, punches through a barrel, and comes to rest in the liquid inside. All of this continued settling could be a reference to the ground of being – which is synonymous with Spinoza’s substance and gets at the core of identity. J.J. Abrams does not use keys often, and when he does, pay attention. Even our primary mandate to follow the monkey may be an intended pun. What do you see in all of these unsettling thoughts? Comment below to get the discussion going. Together we might just find what mystery box that key unlocks. There is only one footnote in Chapter 9. There is only one window in S’s apartment. And there is only one window in another aparment where our one footnote is born. S hears the voices of two people – one of them most likely the infamous Archimedes de Sorbreiro – just prior to Sobreiro falling nine stories from that window to his death. Is this a clue to our missing Chapter 9 cipher – one window, one footnote? The footnote refers to Straka’s struggle with two lines in the book and which voice, male or female, should utter which line. The first sentence of Filomela’s footnote implies that both lines in the original manuscript contain numerous strikethroughs and handwritten corrections, and yet her second sentence says that she reproduced the line (singular) as it was originally typed. There is only one line reproduced. Is this an intentional mistake, as FXC so often includes, to lead us to a cipher? Another thought. On pp386-387, S stands beneath the ninth story apartment window, looking up at it from the sidewalk. As he does, he kicks one foot against the ground, trying to chase away the numbing cold. As he does, he breaks through a layer of ice and discovers the corner of a brass plaque set into the sidewalk. He kicks more until the entire plaque is revealed. Given the manner in which S discovered the plaque, is this a foot note? And what significance might we find in the use of five perfect squares represented? Toccata and fugue: two separate types of music woven into one work. This seems to explicitly refer to Bach’s Toccata and Fugue in D Minor, which of course has its own authorship controversy. The entire chapter seems to do this same thing: have two of something that has become one. Below is an analysis of the chapter itself and then the footnotes, all with an emphasis on the number 2. Any contemporary reader would see the title of this chapter and likely form the image of the 1931 film Dr. Jekyll and Mr. Hyde, which opened with Bach’s Toccata and Fugue in D Minor and his since been associated with horror. They may also think of a second film that was released in 1940: Disney’s Fantasia – which is a merger of classical music and fantasy animation. The title: Toccata and Fugue. A fugue in itself is a contrapuntal work: point and counterpoint. The first footnote uses the word rumor twice. The second Fn refers to Princip. The 8th Fn reminds us that the original title for Ship of Theseus was the Principality of Rumor. 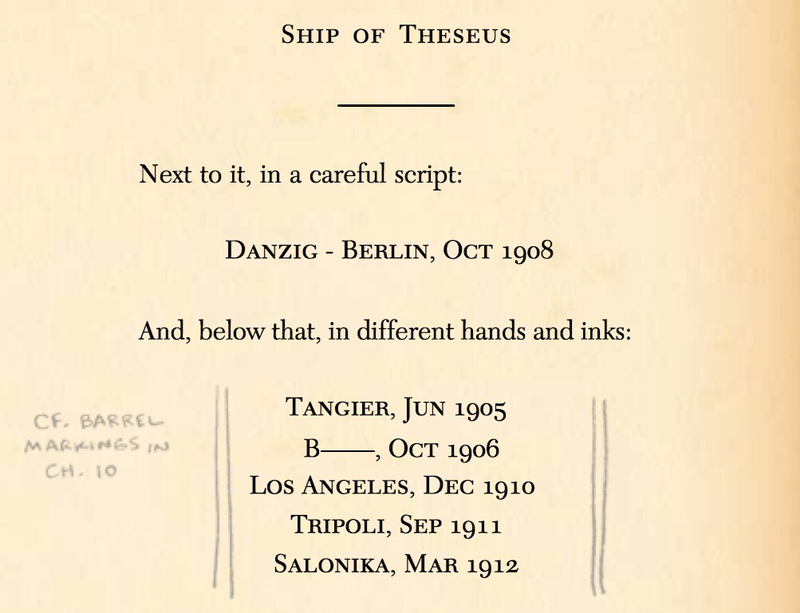 Each section of the Interlude includes two subsections: the assassination and the account of S on the ship. The first agent to die is Agent #4 (or 2*2, 2+2, 2^2). The wall writing emphasizes the differences between what S wrote and what he thought he wrote. 300.1 “For a few years after the publication of Straka’s The Black Nineteen, a bloody tale of political intrigue in the Habsburg Empire, there arose a theory that Straka’s works had been written by “Apis’s Amanuensis”—the mysterious, rarely seen, never-photographed (and possibly not-real) aide to Dragutin Dimitrijevic (“Apis”), who led the Serbian secret military society the Black Hand. (Rumors flourished that the so-called amanuensis was really the brilliant, murderous tactician behind the group’s rise.) However doubtful it may be that this man wrote the Straka books, it is obvious that Straka is playing with that notion here in the Interlude. Strikingly, though, the author turns the tables on the Black Hand agent in this first section. But is this the Amanuensis-Straka killing off his past self? Rejecting a former ideology? A different Straka, killing off one of his rumored identities? None of these? Do you see any other pairings or where these pairings may lead? In the seventh footnote of the seventh chapter of “S”, FXC mentions seven candidates that Straka may have used to create his description of the pouting sailor. The footnote has 56 words (7×8). It’s on page 266 (7x19x2). FXC says “Allow me to prime the pump” – seven is a prime number. The seventh word of the Fn is Straka. S hears the monkey laugh after Maelstrom explains to S that he will willingly return from El H__ after he disembarks (219-220). The monkey runs circles around the female sailor (266-267). What do all these sevens mean? Surely it points to another code or message? What do you think? Fellow “S” fan Adam Laceky pointed out to me that Chapter 2 is filled with colors. His detailed catalog of those colors is below. Perhaps, as he suggests, there is a message or cipher here for us to discover. He may be onto something. Consider that our buried treasure may have been left by Juan Blas Covarrubias, whose last name means red cave(s). Take a look below at the page numbers and color references and let us know if you see anything noteworthy.